Travel into the Texas Hill Country and you’ll find a town steeped in Old World charm that sits at the intersection of two pristine rivers. Beautifully preserved historic homes, buildings, and churches reflect the town’s pervasive German heritage, while its world-class waterpark and wealth of museums, breweries, and wineries make it a place for all tastes and ages. This describes none other than New Braunfels, where the old and new converge unlike anywhere else. At just a stone’s throw away from both San Antonio and Austin, this town provides an ideal weekend getaway from the big city life. Yet there’s so much to do here you’ll keep coming back for more. How many places can say they were founded by European royalty? Not many, but in New Braunfels’ case, it is reality. The town was established in 1845 by Prince Carl of Solms-Braunfels, a German prince and the head of the Adelsverein, the German effort to colonize Texas. While you can sample New Braunfels’ German heritage at its restaurants and bakeries, one of the best ways to see it for yourself is by visiting the Sophienburg Museum. The limestone-walled museum is full of displays showcasing the town’s history, along with local artifacts and photographs that provide valuable insight into its heritage. Massive annual events, such as Wurstfest, Folkfest, and Wassailfest offer additional ways in which you can experience German food, music, and culture when you visit New Braunfels. New Braunfels is steeped in history, but that doesn’t mean the town lives in the past. Today, it’s a popular summertime destination due to the cool flowing waters of the Comal and Guadalupe Rivers. Swimming and tubing on either river provide fantastic ways to beat the summer heat, and the Guadalupe River has an abundance of fish to catch and plenty of space to go kayaking or canoeing. Speaking of aquatic fun, New Braunfels is home to one of the top waterparks in Texas: Schlitterbahn. Thrilling water rides, wave pools, and special kids’ attractions provide plenty to see and do at this summer retreat in the heart of town. Want more adventure? Drive 25 minutes from New Braunfels to reach Natural Bridge Caverns, a stunning natural wonder and one of the top show caves in Texas. Then embark on a safari at Natural Bridge Wildlife Ranch, a 450-acre preserve which is home to giraffes, zebras, ostriches, and many other exotic (and native) animals. To see even more critters, pay a visit to Animal World & Snake Farm Zoo, a long-time New Braunfels attraction where you can see everything from caracal cats and crocodiles to wolves and venomous snakes. Although New Braunfels is a fine place to visit if you love being outdoors, there are plenty of ways to enjoy the finer things in life in town. Indulge in some retail therapy at the various boutique shops in downtown New Braunfels. 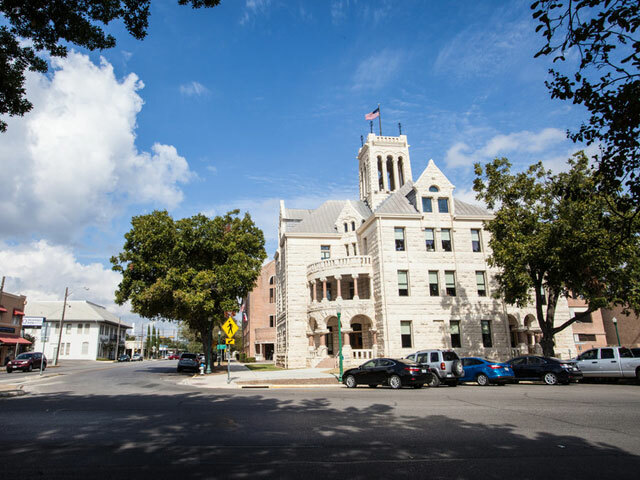 While you’re at it, stop by the Main Plaza to snap a photo of the eye-catching Romanesque-style Comal County Courthouse. There are plenty of restaurants in downtown New Braunfels, but if you’re feeling thirsty and you want something local, make a beeline for one of the three craft breweries in town. For a glass of Texas red or white, head to Dry Comal Creek Vineyards or The Vineyard at Gruene. 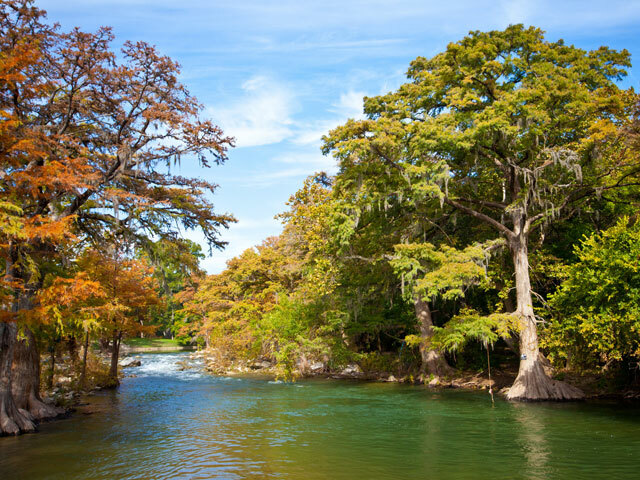 No visit to New Braunfels is complete without spending some time in Gruene, a historic district nestled on the eastern bank of the Guadalupe River just north of town. Although Gruene has its fair share of unique restaurants and shops, perhaps its most notable attraction is Gruene Hall, the longest continuously operating dance hall in Texas. Dance the night away to some good old-fashioned country music, then retire to your room at one of the local bed and breakfasts. A world of possibility awaits you once the sun rises anew.